One of my top five films. So excited to let this roll! Hi Andrea, Congratulations on the release of the project! I can't wait to watch it (I've been trying to PM you). BTW, did you consider uploading it to uploaded.net? The torrent isn't really working out for me. When you get the chance to upload the HD trailer, I'd also love to have it. I'm crazy about trailers! Thanks again for your great effort! Well, honestly I've tried to upload it to uploaded.net, but I gave up almost immediately... infact, I calculated that it will take more than a week to upload it, and only then people could download it (another day or two); with torrent, when a (relatively) lot of people are downloading, then it should download the file(s) faster... or am I wrong? I strongly hope that, when finished downloading, watching and liking my work, someone with a fast internet connection will do it for you and for other users - I encourage it! now that is interesting. universal did a different encode on uk hd-dvd - who would've thoguht. in terms of quality, is the uk equal to the u.s. hd-dvd? what frames were missing? Just to be a bit more specific, Andrea's file of the HD-DVD video was missing frames at the joint between the two EVOs on the original disc - they may be genuinely absent from the US version, or they might have been missed by the software used to join them. I just had to look at my UK copy to compare, and extract the missing frames - it's the same encode, the US version was just improperly assembled. so the us hd-dvd contains all frames or are they missing for good? i mean if one would just demux the video from the evo files. could that "restore" these missing frame? Someone with an original US disc would have to answer that one - I'd speculate that the frames are probably all there in the EVOs, and there's a problem with navigation (or perhaps just with the software used to join Andrea's file, as previously mentioned). While you are seeding this torrent, why not re-up the tv cut? We still need that wonderful hd trailer for The Thing uploaded. 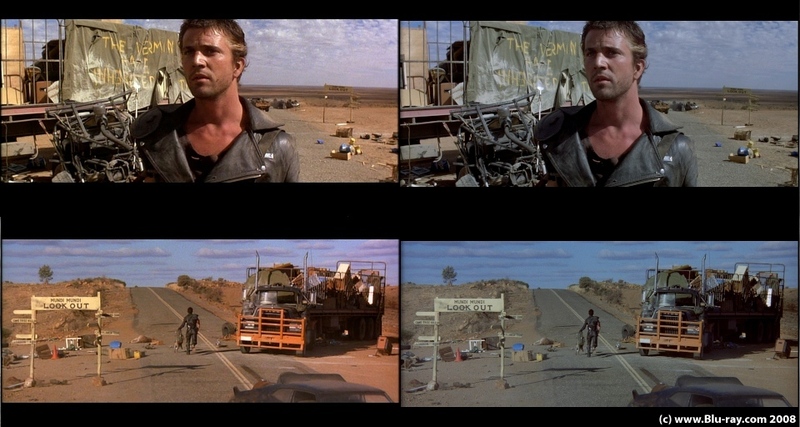 Now it seems the spoRv version appears similar to the original color scheme of the first release of The French Connection on Blu-ray and the HD DVD appears similar to the Filmmakers Series Blu-ray release. Doesn't matter. I'll put the BD25 with the UK Blu-ray and USA HD DVD releases of this film. DoomBot, thanks for the screenshot comparison post. What about the video in motion? Video in motion looks fantastic, i just haven't sat and watched it all yet. After having watched a bit of it and sampled the entire thing, I have to say the colour registration looks perfect. Excellent work, Andrea. This process will be quite useful for other projects, I'm sure. I'm happy everything is ok! I just bought my first BD-RE for the occasion - by the way, 3.5€ is a good price for an Emtec in a jewel box?!? After checking the screenshot comparisons and checking out some of the video, I think I'll likely stick with the HD-DVD colors. Besides losing the snow tint, which makes the snow look a bit more realistic, there seems to be a bit too much of a yellowish cast to some of the actors in certain scenes. And with the direct screen grab comparisons, the revised colors to me seem a bit "lifeless" and washed out in comparison to the HD-DVD. Don't get me wrong, I'm not knocking the process in any way, but I think the cons outweigh the pros on this. Of course, the HD-DVD may have the colors boosted also, but those images seem more pleasing to my eye. I think a happy medium may lie somewhere in between both these. I prefer the warmer colors as well. Still a great effort and the finished product is probably what Carpenter intended the film to look like. I've always liked the HD-DVD even though the colors are probably warmer than intended. I'm a fan so I'm happy to have both. Having just watched it , I must say great job! I only wish I had better equipment to view it on. I have a early model Panasonic BluRay player than can not read BD-R so I use my Sony PS3 which can read it but can not handle errors very well so every 3-5 minutes the picture freezes a while and then when it unfreezes it into the next scene so I lose some of the dialog. I am using a just purchased Samsung SE-506 Burner and Verbatim discs and I have tried burning at different speeds but the problems are all ways at the same spots. So I went back and checked the source file, loaded the movie from the file on my laptop and it played on my laptop. It plays OK but I noticed that every where I would have problems on the disc the file had artifacts during those scenes it is just that my laptop could handle the errors better. "The Thing" is set in Antarctica: it is a "cold" film, and photography reflects this. I'm aware that the HD-DVD (and BD as well) colors are warmer and seems better, but they are not, well, right? You could always watch the [spoRv] version, raise up saturation few notches, and obtain warmer colors; but if you take HD-DVD(BD) and set down saturation, snow will stay blue (or pink, or other color) but will not become white! About BD problems: although I have not burned it on actual BD (yet), the m2ts file plays flawlessy on my old PC, and I tested it with the two most used players, VLC and Media Player Classic, so I can't help. But it seems other users have not problems to play file/burn disc, so probably it's due to your system. The file works fine for me... no issues at all. Any technical problems would probably be on the user end. And yes, warming up the display works wonders if you want richer colors. This project looks great. Thanks again, Andrea. Just finished downloading and watching. Great work Andrea! Just a great effort. Like others this is one of my favorite films so I'm always glad to watch it. I do like the color timing for a lot of things (no pun intended) like the snow being white. Not sure which is correct coloring. The HD DVD and blu-ray look like they used a combination of blue filters and blue gels which would of been common in carpenter's work at the time but I don't know. Publicity photos from the time look like Andrea's version but those are never indicative of the final print. One wonders if the hddvd and br used a different print then the ld? Regardless I love having both versions. Each evokes a slightly different feel/mood and each has as much right calling itself the "correct" color. Nothing but praise from me. Also Jonno has the great Dolby Stereo Surround soundtrack from the laserdisc. Anyway great work on The Thing. 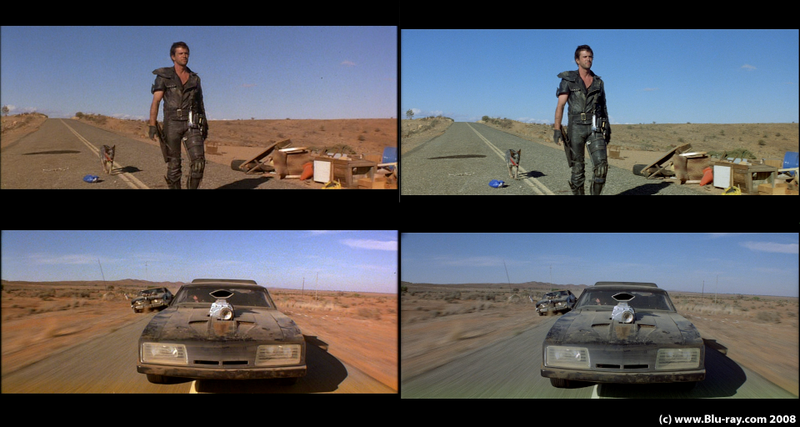 Agreed, Mad Max 2 needs the Andrea touch. Thanks a lot to all of you! The appreciation posts keep me going on. Anr MM2 is another example: who can be sure that the BD has not the right colors that the director has always intended? To me, clearly the BD has wong colors (as "The Thing", "The Matrix" and many others) - this is SO obvious... even with no official reference, or, at the contrary, the studios and/or directors keep telling us that these BD has "the right color grading that the movie should have in the theaters but never had on video because old technology didn't allow that before" (Lucas docet) - when we (educated videophiles) all know that is a big fat lie... OK, I should start a separate thread for this, don't you think? Well, baci to MM2: I have the LD but not the BD; if someone would kindly agree to send me the 1:1 rip, I'll be more than happy to spoRvify it! But take into account I'm involved in many projects right now, and don't know when I'll start the MM2 one. 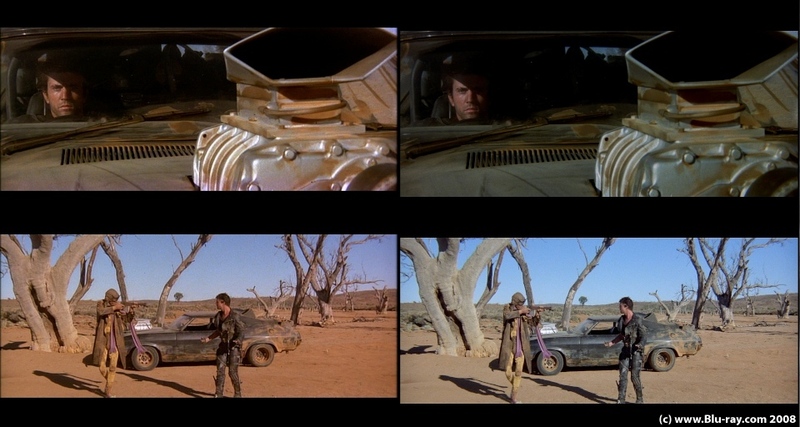 Last thing: what about the other Mad Max movies' color grading?